Most people don’t think about their gutters until something goes wrong, but they should; gutters are an important investment in any home, and they have a significant impact on home values. The latest and greatest innovation in gutters is seamless gutters. 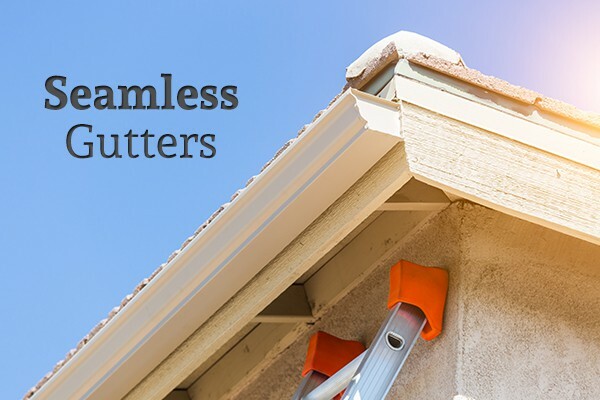 Once you understand what they are and how they can benefit your home, installing seamless gutters on your house may become your next home improvement project. For the most part, gutters come in two styles: seamless and sectional. The names give you a good hint as to the difference. Sectional gutters are mass produced and usually come in 20-foot pieces. These pieces are cut and shunted together to rim the house. Preventing leaks in sectional gutters typically requires you to weld or seal the joints between sections. A seamless gutter eliminates most of those joints by being made to order. Each piece of a seamless gutter is the same length as the side of the house, so the only seams in the system are at the corners and downspouts. The upsides to seamless gutters are both functional and aesthetic. You probably don’t realize how much the multiple joints impact the look of your gutter system, but once you see a seamless system, you’ll notice right away. It’s a cleaner, more professional look, and can improve the value of your home. For most people, the functional benefits are the real draw. Joints need to be sealed, and those seals wear down. The more joints you have, the more repairs and maintenance your gutters will demand. In addition, the seams – no matter how well constructed – are prone to collecting debris. This is the primary cause of gutter clogs, so getting rid of seams makes that aspect of upkeep much more manageable. Seamless gutters are more expensive than sectional gutters initially, but the quality, aesthetics, and lower maintenance costs make them well worth the down payment. Seamless gutter installation is not a DIY project. The gutters have to be machined, usually onsite, which requires professionals. The benefit of this is that you will know that your gutters have been installed professionally. However, if you’re looking to save some money or want to install the gutters yourself, sectional gutters are the better option. If you’re ready to get seamless gutters installed on your home, contact Acme Home Systems today.